Although I was raised in a Christian home with wonderful parents and a solid moral foundation, I found myself pregnant while at college. I decided to have an abortion because I couldn’t even fathom disappointing my parents. I had not followed the path they had desired for me. I knew I had let them down. At the time, abortion sounded like an easy, viable solution. I wish I had talked to someone who could have helped me work through my fears. I wish I could have told myself then that, while my parents may have been disappointed that I didn’t follow their plan, they would be far more heartbroken to learn that I had taken the life of their grandchild. 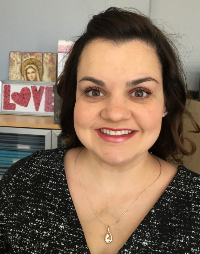 I became involved with Planned Parenthood a year after my abortion. I really wanted to help women and honestly, their marketing was so appealing and positive. They told me that the goal was to keep abortion on the decline…certainly that was something we could all agree on. I continued to work with Planned Parenthood after college and eventually became the director of their clinic in Bryan, Texas. My life completely changed in September 2009. I was asked to assist is an ultrasound guided abortion; an unusual type of abortion procedure. My job was to hold the ultrasound probe on the woman’s abdomen, so the visiting doctor could see the image on his screen. I saw a 13 week fully developed profile of a baby, including his fingers, toes, and heartbeat. All of a sudden, I got this pit in my stomach. When the instrument entered the uterus and repeatedly touched the baby, he jumped, recoiled, and tried to move away. At that moment, what I had been told by Planned Parenthood was revealed to be a lie. I realized I had also inadvertently lied to thousands and thousands of women. The worst part of witnessing this procedure, was when I had the to opportunity to say or do something, I did nothing. I remember wanting to yell out, “Stop! You’re hurting him. ", but I just stood there and watched. After the procedure, I dropped the ultrasound probe and looked at my hands. It was these hands that helped to take a life. I went back to my office, unsure of my next step. I started to pray, really pray for the first time in eight years. I knew I had to leave my job. I didn’t know where I would work or what my future would look like, but I knew that if I trusted Christ, He wouldn’t’ let me fall. I resigned. God intervened in my life through many prayers, including those being prayed outside my clinic by a local profile group, the Coalition for Life. I am a testament to the power of conversion. I am living proof that no one is beyond God’s grace and mercy. I knew that there had to be more people like me in the abortion industry…people who wanted to leave, but didn’t know where to turn. In 2012, I started a ministry to aid abortion workers who desire to quit their jobs, And Then There Were None, www.abortionworker.com. In the last 6 years, we have had over 460 abortion clinic workers come through our ministry, including 7 full time abortion doctors who have put down their abortion instruments and now fight for life. God is waiting desperately to heal those who have been impacted by abortion. Don’t allow these moments to pass you by.